When McLaren announced they were promoting Lewis Hamilton to their race team for this Formula One season, David Coulthard, Britain's most successful active Grand Prix driver, said they were making a mistake. The Scot, a former McLaren driver, believed that putting a rookie driver into F1 as team-mate to double world champion Fernando Alonso risked damaging his career before it had properly started. And Coulthard was far from the only one to say it. In the aftermath of Hamilton's maiden Grand Prix win, taken in only the sixth race of his career, Coulthard's remarks seem unnecessarily cautious. But Coulthard is not the only one who has been forced to recalibrate his understanding of what is possible by Hamilton's quite stupendous start to his F1 career. The 22-year-old from Stevenage now leads the world championship from Alonso by eight points - there are 10 for a win - having set a series of new benchmarks for his sport. Three-time world champion Niki Lauda admits he has been "stunned" by Hamilton's achievements. And that is almost certainly a feeling shared by Alonso, even if the Spaniard has not surprisingly been somewhat less effusive in his admiration of Hamilton's efforts. Alonso, regarded as the finest all-round racing driver in the world, joined McLaren this season on a reputed £10m salary. He said he wanted a new challenge after consecutive titles with Renault. But he certainly did not envisage that challenge coming from the man sitting across the pit garage from him. 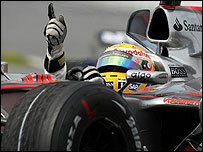 It was Alonso who was to be McLaren's main man as they pursued their first world title since 1999. Hamilton was supposed to quietly learn the ropes alongside him. Instead, Hamilton's combination of electrifying pace, metronomic consistency and eye-opening maturity has turned the tables, and Alonso finds himself playing second fiddle to a man on a 20th of his salary and with five seasons' less experience. But then Hamilton has always flown in the face of convention. 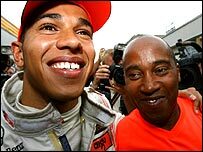 The son of a former British Rail worker, Hamilton is mixed-race - his father's family originates from the Caribbean island of Grenada - and he is the first driver of Afro-Caribbean origin to race in F1. He first met McLaren's team boss Ron Dennis in 1995, when as a starry-eyed 10-year-old at a motorsport awards ceremony, he asked for his future employer's autograph. "He looked me square in the face and informed me where he was going in his life," Dennis recalls. "Without breaking eye contact, he told me how he was going to go about his career. It impressed the hell out of me." Dennis started following Hamilton's career, and a couple of years later signed him up to McLaren's driver development programme. Hamilton's career has been painstakingly mapped out ever since, and he has been provided with the best of everything on his way up through the ranks. But it is what he has done with it that has stood out. Blessed with a natural talent of the highest level, Hamilton also appears to be mentally perfectly suited to F1. "Confidence is often coupled with arrogance," Dennis says, "but there isn't an ounce of arrogance about Lewis." That down-to-earth personality partly explains the huge interest Hamilton has already generated in such a short time. Young, black, articulate and good-looking, Hamilton has drawn the inevitable comparisons with golfing superstar Tiger Woods, and it has become clear very quickly that those were based on more than the colour of his skin. Like Woods, Hamilton always had the potential to attract an entirely new demographic to his predominantly white, middle-class sport. But, also like Woods, he has the talent to deliver on it. And if comparisons with arguably the best golfer of all time seem a little premature for a man who has raced in only six Grands Prix, they should not. 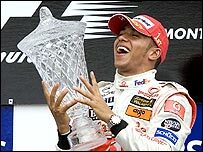 Increasingly those in the know in F1 are talking about Hamilton as potentially one of the greatest drivers in history. Traditionally, it is difficult enough for a driver to win a race in his first season. Yet so great has been Hamilton's impact, so impressive his results, that now the unthinkable seems possible - he could do what no-one has ever done before, and win the world championship as well. 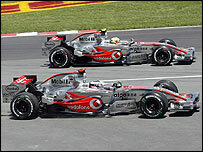 Hamilton is fortunate that in his McLaren-Mercedes MP4-22 he seems to have the car to do it. But this is not an average driver who has lucked into having a superior car in his first season and is being made to look better than he really is as a result of it. This is a man who in his first season, often on race tracks he has never seen before, is taking on the finest driver in the world and beating him. "I'm just having a fantastic day," Hamilton said in the aftermath of his victory in Montreal on Sunday. "This is history." He will be writing a great deal more of it before he is done with F1.